Finally, you'll discover whatever there is to know about the "dragon" radical — and why one might be tempted to call it the "hidden dragon" radical. 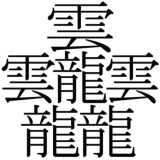 Incidentally, 竜 is a Shin-Joyo kanji; it's a 2010 addition to the Joyo set. 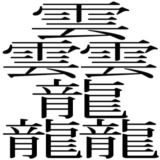 This character is composed of 84 strokes, one of the most in Japan. TO means, the dragons are moving.
. Dragon Words - Vocabulary .
. Kanji and Daruma .